Portfolio asset allocation will be decided using a 12-part questionnaire. Portfolio will be constructed using ETFs, mostly from Schwab-managed market-weighted and fundamental-weighted index ETFs. No advisory fees, no trading commissions, no account maintenance fees. Tax loss harvesting is available on an opt-in basis for clients with invested assets of $50,000 or more. You can do the questionnaire and see your proposed asset allocation without signing up for an account. Here’s a screenshot taken from the questionnaire tool (click to enlarge). 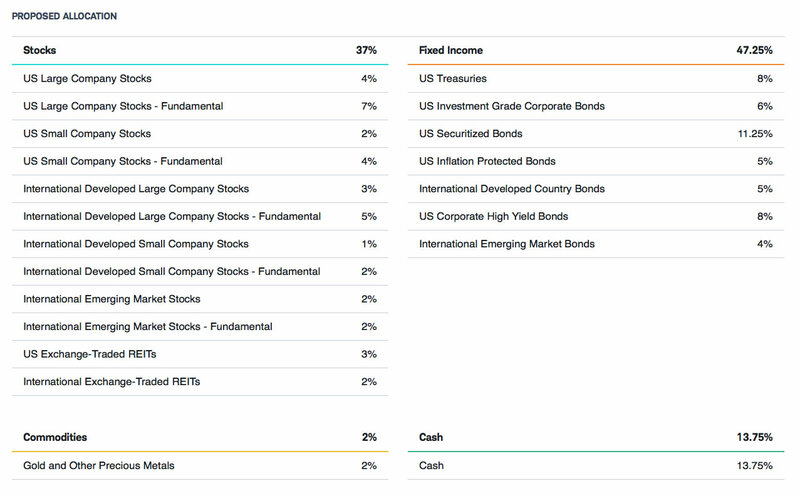 Here are some sample asset allocations that the website provided. I basically just made up two fictional people, so don’t assume these are the only options they give out. First up is “Conservative Cal”, who is 60 years old with plans to retire at 65 and can’t stomach too much volatility. The proposed breakdown for Conservative Cal was 37% stocks, 47% bonds, 2% commodities, and 14% cash. See screenshots below. Next up is “Long-term Linda” who is 30 years old with a long time horizon and a healthy appetite for risk. 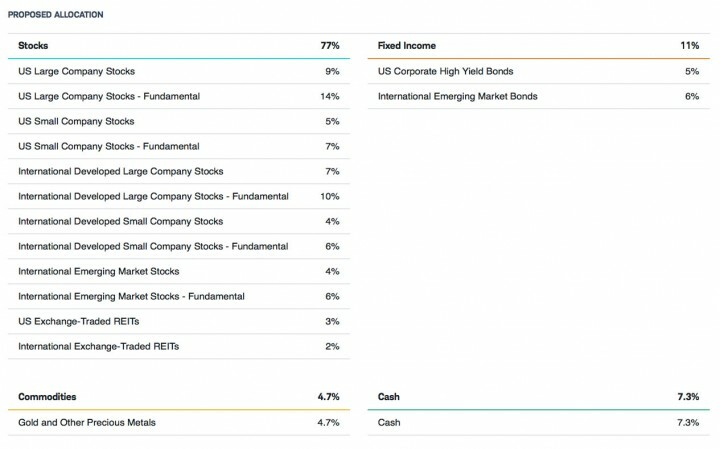 The proposed breakdown for Long-term Linda was 77% stocks, 11% bonds, 5% commodities, and 7% cash. See screenshots below. 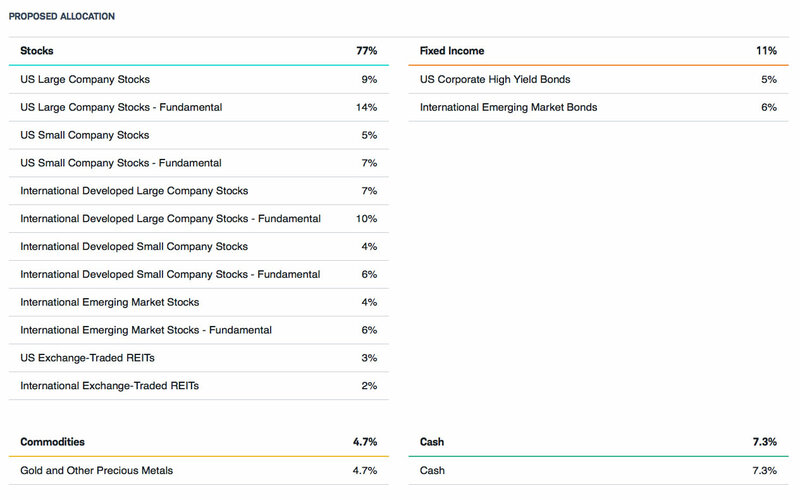 It doesn’t actually tell you the exact ETFs you will be investing in unless you continue and fill out an application, but you can bet that most of them will be Schwab market-cap ETFs and Schwab fundamental ETFs. Also keep in mind that there will be “alternate” ETFs for each asset class to be used for tax-loss harvesting. SIP is a direct competitor to Vanguard’s Personal Advisor Services (VPAS) which has a lower average overall expense ratio on their suggested portfolios, but also charges a 0.30% advisory fee. Schwab’s overall average expense ratios on their suggested portfolios are higher, but charges no advisory fee. Schwab then goes as far as to guarantee that the total amount paid to ETF OneSource affiliates and Schwab ETF management fees will not exceed a 0.30% fee. So Schwab admits that there is some extra profit baked into the program due to their more expensive fundamentally-weighted ETFs and such, but it should still be cheaper than Vanguard after all is said and done. Very interesting. This is not my full review, as I haven’t decided if I should open a test account (superfluous trades get annoying at tax time). 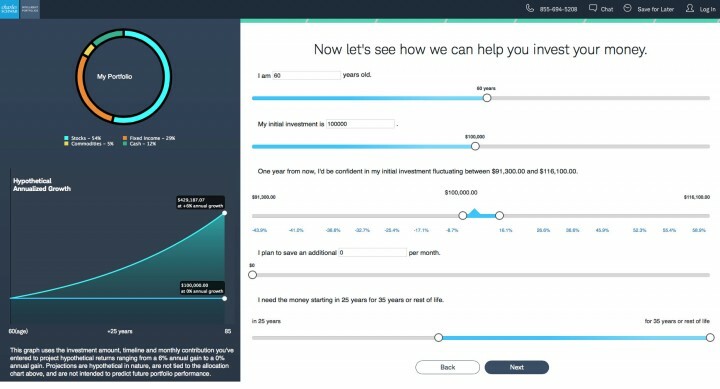 Although I will likely have my criticisms, I am still glad to see it finally roll out because I think Vanguard and others need the competitive pressure to keep improving their own low-cost advised portfolio platforms. A lot of people out there don’t need a full-service human advisor, but could still benefit from having occasional investment guidance available to them at a minimal cost.